Thiruvananthapuram, anglicized as Trivandrum by the British before its original name was restored, is the capital of Kerala. Thiruvananthapuram, literally City of Lord Anantha, derives its name from the deity of the Hindu temple at the center of the Thiruvananthapuram city. Anantha is the avatar of Vishnu when he reclines on the serpent Shesha. 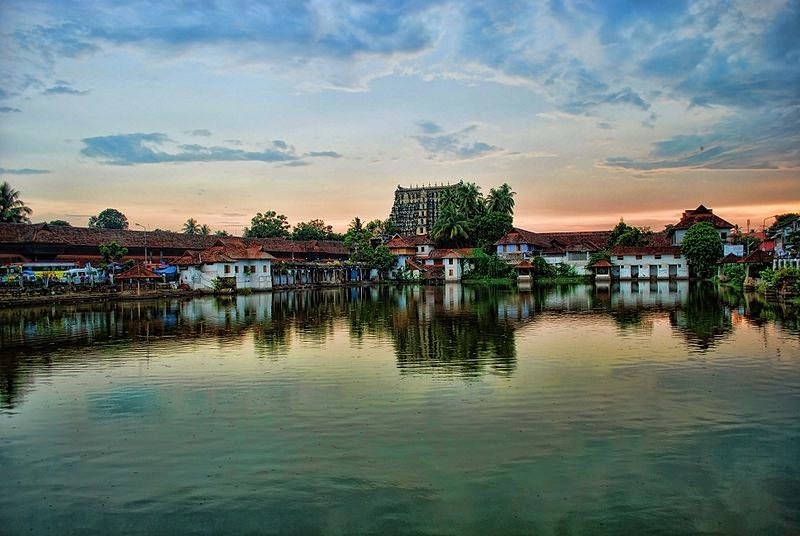 Shri Padmanabhaswamy and its adjacent Royal Palace, Puttan Malika, are the capital's two principal sights. The Observatory, the Science and Technology Museum, the Government Secretariat, the Kowdiar Palace, St. Joseph’s Cathedral, the Tagore Centenary theatre and the Museum, Trivandrum Zoo, Happyland Amusement park, etc are some of the other tourist attractions in the city. The Shanghumughom beach is worth visiting, while other interesting places are Aruvikkara Water Works, Kovalam Beach Resort and the resort of Ponmudi Hills. The Neyyar dam is a good place for hikes, boating, camping and mountaineering. Kanyakumari, the land’s end of India, is only 87 km from Thiruvananthapuram. On the way to Kanyakumari is Padmanabhapuram, the old capital of Travancore, where an ancient palace with antique murals is located. Agastyakoodam is a pilgrim centre for Hindus and one of the highest peaks in the Western Ghats. Women are not allowed up the peak as this is where an ancient bachelor monk once lived. This cone shaped peak is known for its ayurvedic herbs. The Neelakurinji, a flower which blooms only once in twelve years, is another attraction here. A forest pass has to be obtained from the Wildlife Warden at the Forest Department for trekking. Anchuthengu has the historic significance of being the first settlement of the English East India Company in Kerala in 1864 A.D. It was given on lease to the Company by the King of Travancore for the purpose of trade. The remains of the old English Fort can be seen here even today. An ancient Christian church, built in 15th century by St. Francis Xavier, can also be seen here. From here one can sail across the river to Veli by boat. Ponmudi is a pleasant hilly resort at an elevation of 912 m above sea level. There are several tea and rubber estates around the hills, and is home to hill tribe called Kani. Ponmudi has hill-trails for hiking, a collection of flowering trees and a deer park. Ponmudi is 61 km from Trivandrum city. Neyyar Dam is located across the Neyyar river flowing south of Thiruvananthapuram. Lying amidst the southern low hills of the Western Ghats, 29 km from the city, the catchment area offers facilities for boating and mountaineering. A three-hour climb over the hills across the reservoir affords the thrill of hiking. Two waterfalls on the upper reaches of the Neyyar reservoir, the Meenmutti and the Kombaikani, can be accessed through a trek of two and four kilometers respectively, through these dense forests. A Lion Safari Park and a Crocodile Rearing Centre have also been set up in the reservoir. Also on the lake is the Sivananda Yoga Vedanta Dhanwantari Ashram. Varkala is most famous for its beach, but is also a pilgrim centre. The Samadhi of Sree Narayana Guru, the great social reformer and philosopher, attracts devotees from far and wide. The cliffs and mineral water springs at the Papanasam beach are tourist attractions. Kovalam beach is one of the finest beaches in India. A high rocky promontory jutting into the sea has created a beautiful bay of calm waters for sea bathing. The sunset here is amazing, and is one of the must see places for people traveling through Kerala. Azhimala is a beach near to Kovalam. It is a very quiet beach. It is around 20 km from Trivandrum city. Azhimala is known for the Ayurvedic Resorts. There is a temple in the name of Azhimala, the deity is of Devi. The temple is very near to the beach. Since the beach can be viwed from the hill top, the name came to be Azhimala, Azhi means 'the sea' and Mala 'the hill'. One will never forget the view of setting sun from this calm shore. The Museum building itself is an architectural splendour. The Napier Museum, the Natural History Museum, the Reptile House and the Shri Chitra Art Gallery are all within the Zoo complex amidst a well laid-out garden and park. Sree Chitra Art Gallery with its rich collection of exquisite paintings, has a special Ravi Varma section other than one for murals, water and oil painting. There is a lake and a boat club jointly operated by the Department of Museums and Zoos and the District Tourism Promotion Council. The zoo offers a rare opportunity for the visitors to experience an unparalleled, picturesque and panoramic sylvan landscape with a wide range of animal collections. The zoo has 75 different species of animals not only from India but also from abroad. It has several species of animals and birds from Ethiopian and Australian zoological regions. The Lion-tailed Macaque, Nilgiri Langur, Nilgiri Tahr, Manipur deer, Indian Rhino, Asiatic Lion and the Royal Bengal Tiger are prominent among the indigenous endangered fauna, while Giraffe, Hippo, Zebra and Cape buffalo are guests from the African region. Shanghumugham Beach is very near to the International Airport and is easily accessible from the Kovalam Beach, Veli Tourist Village and Akkulam Tourist Village. Shanghumugham beach is noted for its cleanliness. The vast stretch of white sand and the serene atmosphere, away from the crowd in the city, provide all the ingredients for relaxation and for spending an ideal evening. On the outskirts of Kerala’s capital city, by the side of the placid waters of Veli lake, the Tourist Village and Boat Club attracts the city people and tourists. Veli, developed as a major tourist spot by providing facilities for pedal-boating, row boating, swimming, get together, etc. is just the right place for an exciting outing. Veli, with its palm fringed lake is easily accessible by road. By Air Thiruvananthapuram has an international and domestic airport. By Rail Connected by major cities of the country. By Road Excellent road network.